Just when you think you’ve seen it all. 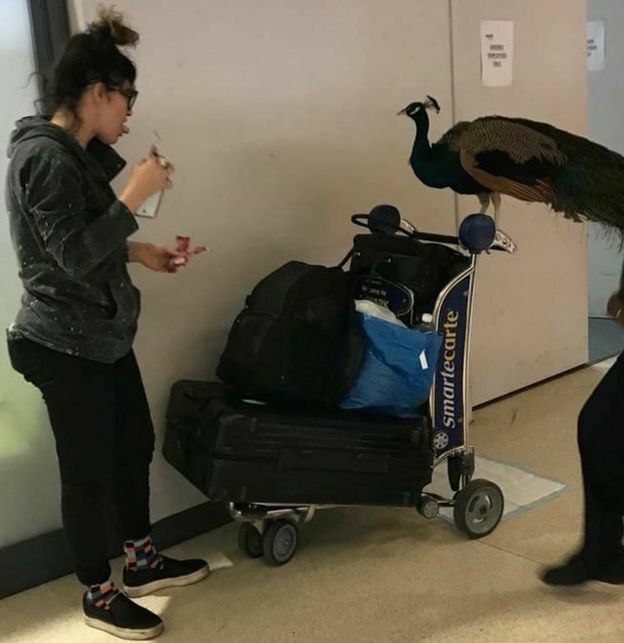 With all the craziness regarding people bringing fake service animals into retail stores, now someone pushes the envelope even further, by trying to bring “an emotional support peacock” (Never in history have those words been muttered before…) aboard a United flight. At least United turned them down. The scariest part of this article is that airlines have previously allowed a pig, turkey and 80 birds of prey aboard planes. Sorry folks, but if you bring any of those in my drug store, you are getting the boot. And if they are aboard any plane that I’m flying on, I’ll be taking the train, thank you very much. A female traveller was recently banned from taking a large “emotional-support peacock” on board a United Airlines flight, it has emerged. She had offered to buy the bird its own plane ticket, according to travel blog Live and Let Fly. 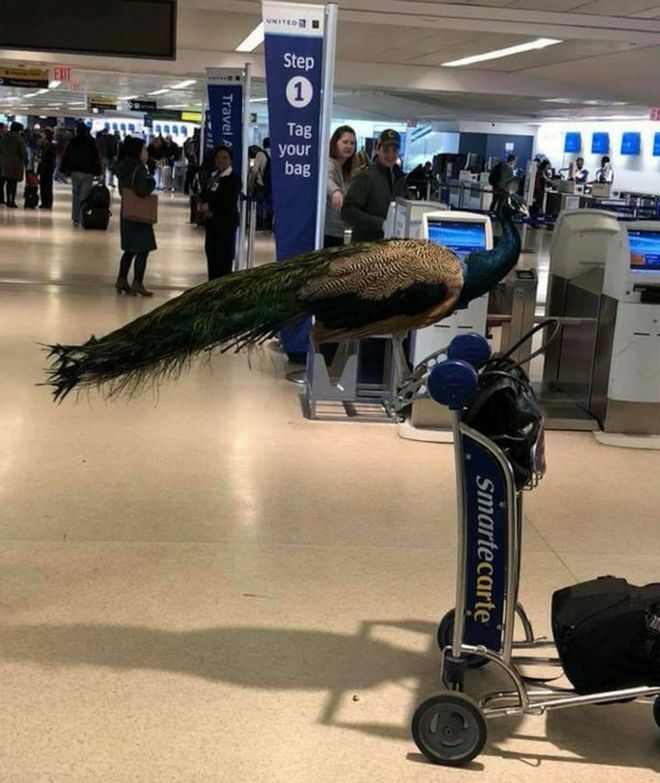 Nonetheless the airline refused to let the bird board at Newark airport in New Jersey, saying it did not meet guidelines due to its weight and size. United says this was explained to the traveller before she arrived at Newark. Pictures of the striking bird and its owner, attempting to travel to Los Angeles, emerged via The Jet Set, a travel-based talk show. The images show the animal perched on an airport baggage trolley, as fellow passengers gaze at it in shock. After six hours at the airport, the exotic bird and its human companions decided to take to the road and instead drive across the US. The peacock, reportedly called Dexter, belongs to Brooklyn-based artist Ventiko, who documents its life on social media. “I have never left the house without having at least one person react,” Ventiko told a local culture website in 2017. The artist, whose real name is not known, told Bedford and Bowery that the feathery giant “really changed my life in a positive way”. She originally bought Dexter and a peahen called Etta for an art installation. She later found them a new home from which Etta and her offspring disappeared. The loss affected Dexter’s behaviour and Ventiko came to his rescue after hearing that the bird was housed in a garage. Following a failed stint at an upstate New York farm, Ventiko finally decided to welcome Dexter into her Bushwick loft. Now involved in her photography and performance art, the exotic bird appears to enjoy his New York life. However, he avoids public transportation, like the subway, because Ventiko doesn’t “want to traumatise him”. Airlines have allowed some passengers with emotional or psychiatric problems to take therapy animals on board with them. But the number of emotional support animals has been rising in recent years, sparking suggestions that people are abusing the system. In 2014, a woman was escorted off a US Airways flight when her pig, named Hobie, defecated and squealed before the plane took off. Had Dexter made it on to the plane, the peacock would have joined a flock of jet-set birds. Traveller Jodie Smalley, from Seattle, made headlines after taking her turkey on a pre-Christmas flight home in 2015. Cynics were surprised to hear that the bird made the return trip back in one piece – and wearing a special bird nappy. A year ago, a photo of 80 birds of prey was captured on board an airliner in the Middle East, promptly going viral online. The falcons were being flown from an unknown destination to Jeddah in Saudi Arabia, for what was believed to be a hunting trip.